﻿ Electronic Signatures with SignOff™ | Products | Datawitness Online Ltd. When you use our electronic signature software to send your contract or agreement to a recipient for signing, you automatically capture a legally binding electronic signature without moving paperEvery gallon of gas burned creates 28lbs (12.2kg) of carbon dioxide in the atmosphere - 19lbs from the tailpipe and 9 from refining and transporting the fuel. The average car creates 70 tons of carbon dioxide over its lifetime. between parties. Send simple agreements with our electronic signature software and receive confirmations when they are complete. 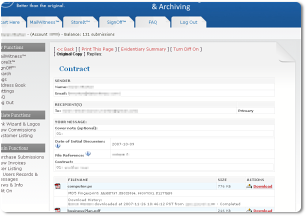 Or track every step of an ongoing exchange of documents on the way to a final agreement using Datawitness' online control panel. New electronic signature laws allow a purely electronic process for delivery of documents for signature. Datawitness uses a legally tested click wrap process that includes all steps required for binding electronic signature capture that will stand up in court. Have Datawitness SignOff present while you send a contract, or other type of form, for sign-off. Datawitness SignOff works as a 3rd party witness to witness the document and protect you if a dispute arises over the agreement. Datawitness authenticates your document and creates a unique digital fingerprint for each document you archive in a way that no other electronic signature software does. The fingerprint establishes proof of your document's authenticity. If the fingerprints of your archived document and the document you are comparing match, the documents are legally considered identical and guaranteed unaltered. 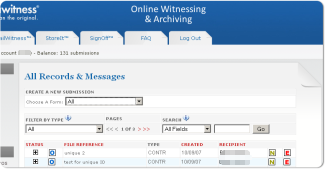 Datawitness' online filing and retrieval system creates an authentic copy of each document for online and off-site storage. A digital copy is accessible any time via the Internet, and a physical copy is kept on long-term archive media, and stored in our secure storage facility. You can rely on Datawitnessed records in court. New laws permit the conclusion of contracts and agreements online. Our online signature service called SignOff™ dramatically speeds up what used to be a cumbersome and sometimes costly event by allowing instant online contract signing. No couriers, No paper. No problems. Contract Signing can be easy. There is no easier way to get a signature witnessed. Get Started Now! Contact us today and get started with electronic signatures, or sign up online. The average time to retrieve a paper document from a file is 5-7 minutes.